I recently let slip that I'd bought a Sony PRS-950 eReader, bringing my total eReader collection to four dedicated devices plus one smart phone: I now own (in order of purchase date) a Nook Classic, a Nook Color, a PocketBook 360, and a Sony PRS-950. The funny thing is, I wasn't really planning to buy a new eReader. But then B&N came out with their new Nook Simple Touch and I was sorely tempted. So how did I end up with a Sony device? The answer, actually, is pretty simple. 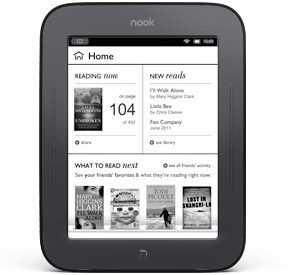 The Nook Simple Touch (or N2, as the second eInk Nook) really sold me on the idea of a touchscreen eInk reader but with dedicated page-turn buttons. When it comes to touchscreen versus buttons, I'm very much a hybrid girl: I love being able to touch-to-highlight words on my Nook Color, but I appreciate having the volume buttons on the device mapped to page-up and page-down functions -- the mapping to physical keys means that I don't have to touch the screen unless I have to. Once I started thinking in terms of a touch screen eInk reader, the choices narrowed down pretty quickly to three big players: the Nook, the Kobo, and the Sony. And once I maintained a "physical buttons required" position, the intriguing new Kobo was out -- as lovely as the new Kobo Touch is, I didn't want to go for a full-touchscreen device yet. So why Sony over the Nook, especially when I've turned down Sony offerings in the past when I picked my PocketBook 360 over the Sony PRS-350? The answer is that Sony brought enough pros to the table with the PRS-950 and B&N brought too many cons to the table with their N2. The biggest reason I didn't go with the PRS-350 when I was looking for a pocket reader was because the Sony PRS-350 didn't have an expansion slot for extra memory -- you were stuck with the 4 GB internal memory, which was already 2 GB too small for my current library. The Sony PRS-950 has rectified this situation with an expandable SD card slot that currently houses a 32 GB card that contains my entire library. And then there are the Sony "collections" which are basically book shelves that you can customize and send directly from the Calibre interface in mere seconds; this delightful and crucial feature was possible for the Calibre team to achieve because Sony left the shelving interface open to external programs to modify. 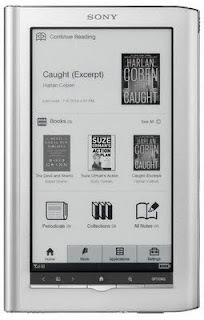 The Nook line, in contrast, has always left the shelving interface closed to external programs, and the user has to shelve all their books individually on each Nook device they own, with no way to backup or share the data between devices. As a software engineer, I consider a closed design like this to be a single step from "useless" -- what good is a system that takes hours to set up and cannot be backed up in case of disaster? More importantly, in my opinion, the Sony PRS-950 provides the best PDF support of any eInk device on the market. I have a lot of PDF books, ranging from manga and comics to text-PDF books provided by NetGalley. The 7" screen on the Sony PRS-950 gives a lot of starting real estate for the PDF, and the software on the device provides a plethora of zooming and panning options. If you just want to trim a few inches off the margins, you can zoom and reposition the PDF page until it is perfect for your needs, and then you can lock that zoom into place so that the rest of the book is read in that same position. This is perfect for text-PDF books. If the PDF has two columns of text and you're going to be panning around a lot, the reader offers the ability to go into a "two-column" mode where the screen is divided into four quadrants -- you start in the upper-left hand corner of the screen, a page-turn takes you to the lower-left hand corner, another page-turn takes you to the upper-right corner, the third page-turn takes you to the lower-left corner, and then the last page turn takes you to the next page. This is ideal for PDFs that display two columns of text, and I've already had to use it for one NetGalley book. The level of customization on the Sony PRS-950 is absolutely delightful. You can read in landscape or portrait orientation. You can zoom in and lock your zooming preferences into place. You can skip forward in the book and then bring up a "page history" guide to zip back to where you were however many page turns ago. You can highlight or scribble notes with the stylus. (You can, supposedly -- I haven't tested this yet -- export your highlights and notes.) You can look up selected words in the dictionary on both the N2 and the PRS-950, but you can also look up selected words on Wikipedia with the PRS-950. About the only thing you can't easily do is load up a custom font, but I've worked out a way with the good folks on Mobile Reads and I've written a guide for the method. The N2, by contrast, feels largely limiting to me. Where the PRS-950 embraces PDFs, the N2 treats them like second class citizens -- no panning, no zooming, and certainly no user-locked zoom. Text-PDFs are re-flowed awkwardly; image-PDFs are fitted to the 6" screen and what you see is what you get. How disappointing. The N2 doesn't support landscape view -- neither for PDFs nor for ePub books best read sideways (poetry is often viewed in landscape); and you'd better lay down a bookmark before skipping forward in a book, because once you leave the skipped-to page to look ahead, the soft-key "Back" button disappears. Worst of all, the N2 still doesn't support syncing or exporting for notes and highlights -- if your device crashes or is lost, your annotations go with it. Some people will legitimately point out that I'm expecting too much from the N2. The N2 is a $140 reader; the PRS-950 ranges from $300 on the Sony site to $200 in Best Buy stores. Perhaps it's reasonable that for the price difference, B&N would strip out full support for PDFs, web browsing for Wikipedia, sync and export for user annotation, landscape reading mode, audiobook support, and 3G downloading. Goodness knows that the N2 is a dream-come-true for some readers -- particularly people who want to buy novels from B&N, read without annotating, and don't have a large PDF library. For those people, a $140 price point for a touchscreen eInk device is ideal. But I'll admit, I'm a little wary of recommending the new N2. I wrote earlier in the year that I was becoming more disillusioned with B&N as they strip out more and more of their customer support structure and as they continually fail to upgrade the software on their devices and on their website. Since then, all the problems I've noticed with B&N have only gotten worse -- their much-anticipated update for the Nook Color was only announced when the Home Shopping Channel accidentally broke the news, and when the update did come, it was an anemic and pale shadow of what we'd been promised. The biggest items on the online customer wish lists (including better PDF support) were completely ignored; the B&N response was to throw a couple of PDF apps in the store and expect customers to pay for the apps in order to read their books on their readers. And now, with the N2, users are complaining of serious ghosting issues arising from the "1 screen refresh every 6 pages" feature. The Kobo Touch -- which came out later than the N2 -- has already released a firmware fix for this issue on their device; they now allow the users to set individual preferences for page refresh rates. The Kobo team did all this while participating in the Mobile Read forums and talking to customers about their experiences; the B&N team won't even acknowledge the ghosting issue on the N2 in their own site forums! Brand loyalty is a funny thing. I would never claim Sony is a better company than B&N: on the contrary, I dislike their Sony Reader store and I hate their draconian lawsuits and tendency to go after people who jailbreak their game consoles. But I didn't buy a Sony reader because I have warm fuzzy feelings for Sony -- I bought a Sony reader because the device does what I want it to for a price that I consider fair. A few months ago, I would have bought the new B&N reader out of brand loyalty: it's a pretty device and I have over 300 books in their ecosystem. But the device isn't currently good enough for my needs, and B&N's persistent refusal to address my needs (even a simple "planned updates" list on their website would be nice) has chipped away at my brand loyalty enough that I'm not willing to stick with them further in the hope that patches will eventually come for all this missing functionality. If the functionality is eventually added in, then I might consider buying, but then again, I already have all the eReaders I need. Maybe it's because I have a PRS-505, and maybe it's because I'm using it a lot more lately. (Good as I am at holding a book in one hand, an ereader is easier to handle when nursing an infant.) But I am peevish at the slowness every time I connect my reader to my system, both withing the Sony store and in terms of getting books onto and off of the Reader. I'm also peevish at the prices Sony charges, as well as the inability to change font size well on a pdf, but those aren't Sony-specific concerns. Mostly, I want the format wars to be over (that is, I don't want to be locked into Amazon or B&N or any other place) before my child starts demanding an ereader of their own. I still think that Baen (and by extension, Subterranean Press, amongst others) have the right way to go in terms of ebook buying. You pay once, and you get all the formats, and you can re-download your books any time you want. I don't know why other publishers haven't started doing anything similar. That said (and the realization that my comment has nothing to do with your post) I do appreciate the review of the Sony. I don't see a lot of reviews for the Sonys any more, and they seem to have been supplanted by the coolness of the Kobos and Kindles. So thank you for this! @4b1e2a35e4e2bbb7249e946a03226f02 Oh, I COMPLETELY agree on the DRM issue. My aunt recently asked me about the N2, Sony models, and the Kobo Touch, and after giving my opinion, I ended with, basically, "Whichever you go with, buy from the Kobo store." It's subjective and everyone has the right to make their own choice, but for me personally I don't like the Amazon-flavor DRM. I don't like the B&N-flavor DRM. I don't like the "you can only download via the Reader Software" Sony model. Kobo uses standard Adobe which I don't like, but it's imho the easiest to move between devices (a Kobo book can be read on the N2, the Sony models, AND the Kobo readers). But Baen's model is definitely superior. It looks like Sony is staying in the business. Rowling's PR machine has recently (as in, today) hinted at Harry Potter themed Sony eReaders. Gods help the person who decided to collect them all. Excellent review. Thanks for posting this! I hadn't heard about the ghosting issues on the K2 before. That Kobo touch is looking nicer and nicer as a low end ereader.